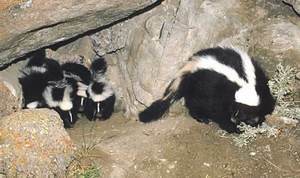 Forest Grove Skunk Removal can help solve you skunk problem, prevent it from happening again, and deodorize if you have a skunk spray at your house. We are a professional wildlife control company serving Forest Grove's pest animal control problems. Skunk calls are one of our more common job's and we have solved many problems over the years. One thing many companies do not offer is an actual solution to the problem. If they just trap and remove the skunk's, what is stopping a new family of skunks, opossums, raccoon's or any other critter from moving in? We understand the the problem is that the animals are able to get under your house or deck, and because of that critters can move in. We are able to seal up your property to prevent future wildlife problems. We call this process exclusion, which we make sure no skunk's or other animals are under your house or deck then seal it up prevent future problems. Feel free to contact us for more information or to get help with the skunk removal process. Forest Grove Skunk Control and Removal Call 503-201-2432!